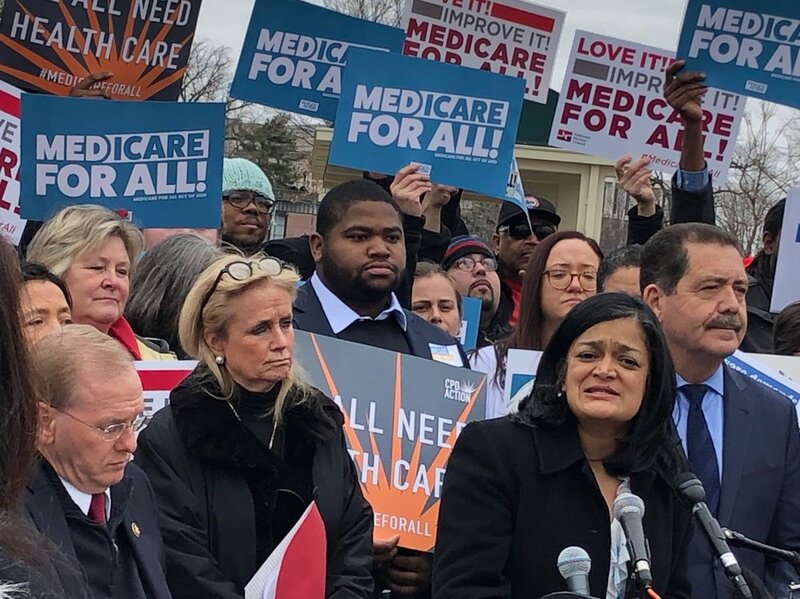 Congresswoman Jayapal and Congresswoman Dingell introducing the Medicare for All Act of 2019. With more than 100 co-sponsors and endorsements from 50+ organizations, there is widespread support for the Medicare for All Act of 2019, legislation introduced by Rep. Pramila Jayapal to guarantee health care for everyone through an expanded and improved Medicare. Our health care costs are more than double any other developed country -- 18% of GDP -- and yet, we have the highest maternal and infant mortality rates, highest rate of preventable deaths, and the lowest life expectancy of any developed country. Two-thirds of people who file for bankruptcy say medical problems are a key contributor to their financial downfall -- not because they don’t have health insurance but because their insurance isn’t enough. People are forced to make the impossible choice between bankrupting their families and accessing life-saving care. The United States pays, by far, the highest prices in the world for prescription drugs. Compared to our peer countries, we spend twice as much on prescription drugs. Each year, 1 in 5 Americans skips doses or fails to fill prescriptions because they are simply unaffordable. The Medicare for All (MFA) Act of 2019 will build upon, expand, and improve Medicare. It will cost less, while covering more. This legislation will eliminate copays, private insurance premiums, and deductibles. With MFA, the average family will pay 14% less in health care costs than they pay now. Medicare will now cover much more than before, including primary care, vision, dental, prescription drugs, mental health and substance abuse, long-term services and supports, maternal health care and more. This legislation guarantees that everyone is covered with high-quality health care -- a vast improvement over our current system, which leaves more than 70 million uninsured or underinsured. Hospitals and doctors will continue to practice medicine privately and independently as they do today. Americans will have more freedom to choose their health care provider because the MFA Act of 2019 eliminates the concept of “out-of-network” providers. Optimal Transition Period: Other versions of Medicare For All have outlined plans for a one-year or four-year transition. The MFA Act of 2019 outlines a two-year transition that will ensure that for those who already have health insurance plans, their coverage won’t be disrupted, while avoiding any unnecessary administrative burden by providing a two-year transition period. The first year will be dedicated to administrative setup and preparing to enroll anyone under 19 and 55 or older by the end of the year. A Medicare Transition buy-in plan will be available on the ACA marketplace until the end of year two, by which time everyone will be enrolled into the MFA program. Long-term Supports & Services: The MFA Act of 2019 provides fully covered long-term services and supports to people of all ages and disabilities with a priority on supports through home and community-based services unless the individual chooses otherwise. This will provide significant relief for the 43.5 million unpaid informal and family caregivers -- most of them women -- who are forced to leave the workforce to take care of their loved ones, and for the 500,000 people on waitlists for home and community-based care. Medicare for All will finally rein in prescription drug prices: The MFA Act of 2019 eliminates the copay and instead uses a combination of negotiation and compulsory licensing. If drug companies refuse to negotiate, the Secretary of Health and Human Services can authorize generic manufacturers to produce the drug in question, by licensing patents or other exclusivities related to the drug so that qualified generics can enter the market and compete, even if the product has patent protection or government-granted marketing exclusivity.